As NASA's New Horizons spacecraft sails away to Pluto, one bunch of musicians is particularly intrigued by its journey: Styx, the rock band that shares a name with Pluto's smallest moon. Members of the iconic rock group recently met with the space probe's NASA team at the mission's headquarters at the Johns Hopkins University Applied Physics Laboratory (APL) in Maryland. There, the rockers glimpsed the newest photos of Pluto and its five known moons. Styx and Stern: Styx band members are intrigued by the latest images of Pluto and Charon from New Horizons. Left to right: Lawrence Gowan, Todd Sucherman, Tommy Shaw, New Horizons principal investigator Alan Stern. 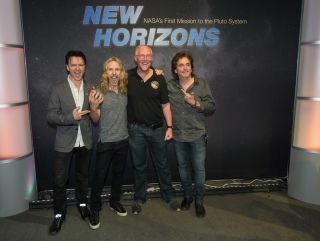 Styx ambassadors Tommy Shaw (vocals and guitar), Lawrence Gowan (vocals and keyboard) and Todd Sucherman (drums) toured APL and New Horizons' mission control center during their visit. The band members also posed for photos with the mission team, according to a statement from NASA. Styx poses with members of the New Horizons mission team, who greeted the band at the Kossiakoff Center Auditorium, Johns Hopkins Applied Physics Laboratory, in Laurel, Maryland. The band chose its name exactly four decades before the moon Styx was identified. Back then, in fact, astronomers didn't know Pluto had any moons at all. (Charon was discovered in 1978, while the other four were first detected between 2005 and 2012.) Styx orbits Pluto at a distance of about 29,000 miles (47,000 km), making one loop around Pluto and its biggest moon, Charon, every 20 days. The three band members met up with Mark Showalter from the SETI (Search for Extraterrestrial Intelligence Institute) in Mountain View, California. Showalter, who led the team that discovered Styx the satellite, was "over the moon" to meet the rock group, according to the NASA statement. A longtime fan, Showalter autographed a poster of Pluto and its moons taken by the New Horizons probe for the band, writing: "I wish Styx (had been) so easy to see from Hubble! Would have made our lives a lot easier," the statement said. There's Styx! Styx's Tommy Shaw points out Pluto's smallest moon with New Horizons team members looking on. You'd be fooling yourself to think the moon was named after the band — both were named for the river Styx that split Earth from the Underworld in Greek mythology. In fact, after the satellite (which was originally dubbed "P5") was discovered, William Shatner (famous for playing Capt. James Kirk on the original "Star Trek" TV series) led the charge to name the moon Vulcan, after the Roman god of volcanoes —and the home world of Star Trek's Mr. Spock. "When Pluto's moon was named, it was for the river Styx — but no kidding, we really had you guys in mind, too," Alan Stern, New Horizons' lead investigator, joked to the band. The team will watch avidly as the New Horizons probe flies within 7,750 miles (12,500 km) of Pluto on July 14, cutting past all of its moons to take a close-up view of the dwarf planet's surface.